This post has been sitting, complete, in my drafts file since early June. I haven't had the motivation to publish it because some of the events clearly show that I was unhappy with my last barn. Ultimately, this was the final event that showed I needed to move. I'm still working on the final "Why we moved" post but this will serve as a nice beginning to that story. Cupid and I, along with our barn family, attended the May Hunter Jumper show at the Sumter Equestrian Center in Bushnell, FL. I will warn you that I unfortunately didn't get any under saddle pictures and don't have too many "barn" pictures from the show. But, take my word for it that Cupid looked stunning and like a real show pony. The show took three days and I'll do my best to breakdown the events of each day. Once I got the cars switched and retrieved my supplies from my house I headed over to the barn. I was thankfully the first person to arrive at the barn for show prep. Knowing that I have a grey horse, who lives for a good roll in the dirt, I wanted enough time to get her relatively clean and presentable. It took us a good 30 minutes in the wash stall to finally have the water run clean and the conditioner worked through her tail. I would love to say that she enjoyed the spa treatment but she would much rather have other forms of human contact. By the time we finished with her bath the other girls started to arrive and get their horses ready. This allowed me to stick Cupid in her stall for a quick lunch and give my tack one final cleaning. I also had to figure out how to fit a second saddle in the car since the teen didn't grab her tack (or make any effort to prepare her horse). Once all 5 horses at the main barn were done with their baths, and all the tack was packed, we were ready to load the trailers. Because we were taking two mares and a stallion we had to use two different trailers. Cupid went with two of the geldings and the other mare, the stallion went with the third gelding (who is actually his son!). The two geldings went in the trailer fine, and the other mare put up a bit of a fight but walked right in when she realized there was hay in the trailer. Cupid, on the other hand, made sure everyone knew she didn't want to go in the trailer. Just as my trainer was putting on her gloves to really get a grip on the lead rope, Cupid charged up the ramp and settled in the trailer. I was relieved that she went on the trailer when she did, because the assistant "trainer" had headed into the barn to get a whip. The drive was uneventful and we arrived at SEC fairly quickly. The horses all unloaded fine and the second trailer caught up just when we finished taking everything off the first trailer. Immediately after everything was settled we hopped on to do a quick warm up ride in the rings. Cupid and I were in the pony ring since we were doing beginner classes. She was an absolute rock star for our warm up. We nailed all our transitions, and jumped all the jumps. We did have one tiny spook when a small pony, like really small, came at us but after a quick circle we cleared the fence. I couldn't have been prouder of how easily my pony settled into our ride and how well she did. Once the horses were settled for dinner we all went to check in at the hotel and grab dinner. The barn owner went back to do night check and we all went bed for the night. Saturday was going to be a fairly easy and all of our riders had classes sprinkled through the day. Cupid and I would be competing in the walk/trot crossrails classes. We had our stallion in the jumper classes in the morning, then the rest of us were spread out throughout the day. I arrived at our stalls just after the barn owner and her husband finished filling waters so I got started feeding the horses. By the time all the horses were fed I got ready to start brushing Cupid. My plan for the day was give her a really good grooming in the morning, then pick her feet and do a quick touch up brush before our class. As I was taking my brushes out of the trunk Cupid started behaving strangely. For some unknown reason she started pacing around in her stall and rearing to see the horses behind and on side of her. The more I tried to calm her down the more spun up she seemed to get. After 45 minutes of her "temper tantrum" something suddenly clicked and she instantly calmed down. I gave her a quick grooming and went to watch our first rider, competing with the stallion, in the jumpers. Our jumper rider did amazing and managed to place in her class. She was shortly followed by our two walk/trot pole riders who were riding the other mare and the "skittish" gelding. Both of them managed to place well in all their classes, and the skittish gelding even took Champion! While our walk/trot pole riders were going there was an announcement for all cross rails riders to come to the show office for their class placements. Due to the amount of riders they were dividing the class into two sections. Cupid and I would be going in the first section, and the other rider on my team with the other mare would be going in the second section. After plenty of sitting around it was time for Cupid and I to prepare for our classes. I quickly groomed her and tacked her up with the assistance of the barn owner. We received a pep talk from the barn owner who gave us some tips she had picked up over the years, this was a welcome distraction from the pressure to do well. Cupid and I entered our first class, walk/trot hunter on the flat, and did amazing. Cupid was extremely looky for the first few laps of the ring but settled once I started whispering to her. The judge only called for the walk and trot both ways which disappointed me because we had worked extensively on our sitting trot and backing up. But when we were called to the center of the ring I was excited to hear we were awarded 3rd for the hunter on the flat portion of the division. From the walk/trot hunter on the flat we went right into the walk/trot equitation on the flat. Like the hunter on the flat, the judge only called for the walk and trot, no sitting trot or backing up. We received a 2nd place which holds the honor of being the first 2nd place I've received with Cupid. As we were exiting the ring I volunteered to be the first person to do the over fences portion of our divisions. Because Cupid had laid down last year between the flat and fences I wanted to get her over and out as quickly as possible. Our first fence class, walk/trot crossrails hunter, went amazing. Cupid was responsive and for the last line I seriously considered asking her to canter. The course went line by the judge, diagonal, line by spectators, diagonal. We circled and the gate attendant asked if we wanted to do our second round. I quickly said yes and we started our next round. This round went great until the last line. The course was line by spectators, diagonal, line by judge, diagonal. When Cupid and I reached the line by the judge she refused the second fence. I quickly circled her and we made it through the rest of the course. Upon finishing the course my trainer asked if I wanted to do my third round which was equitation, I stupidly said yes. This course was line by judge, diagonal, line by spectators, diagonal. For this round Cupid and I made it over the first fence but refused three times at the second, which was the fence we had issues with at the last course. I excused us and left thinking I had blown our chances at getting a tri-color for the equitation division. Despite her refusals Cupid received lots of carrots, ear scratches, Gatorade, and love. She had done amazing for her first over fences classes at a show. I returned to the ring to watch our final two riders of the day and was pleased to hear that we had received a 2nd in our first hunter over fences course, a 5th in our second hunter over fences course, and a 5th in our equitation over fences course (despite making it over one fence out of six). The second walk/trot crossrails class had two of our riders competing in it, the barn owner on her 4 year old gelding (flat only), and the teen on the other mare. They entered the ring for their hunter on the flat portion and both pairings looked great. The barn owners gelding was not phased by the crowds or other horses even though it was his first show ever. The mare is an old pro at showing and clearly knew what she was doing. While the riders were trotting in the first direction the gate attendant walked over to my trainer and informed her that the mare was excused by the judge, she had appeared lame to them and would not be allowed to finish the class. My trainer called the teen over and as she left the ring, explained what happened and she could not ride in the flat classes until we figured out what was going on. Ultimately the teen was not able to finish her classes for the day, there were no other horses that would work immediately. The barn owner successfully finished her flat classes with the gelding and both horses received plenty of attention for doing their best. The final rider of the day was the assistant "trainer" who would be competing her gelding in the crossrails class. Her class was uneventful. Both the trainer and the gelding have been around the block with shows. They cleared all the fences and, I believe, placed in every class. We all cleaned up our horses and area, fed them dinner, and left for our own dinner and beds. Once again the barn owner returned to the Equestrian Center to do a final night check. I got up early for the final day of the show, packed, got breakfast, and headed to the show grounds before anyone else. I quickly got everyone fed and watered, then started to get Cupid ready for the day. Once everyone else arrived we all tacked to get at least one practice round in before the rest of the competitors arrived. Most of our riders, including Cupid and I, were competing in the pre-long classes so we all needed the practice before our trainer got too busy. I walked Cupid out of her stall as soon as she was tacked up and I was ready. As we were walking around waiting for our turn to use the mounting block Cupid began to get wound up. She became extremely looky and interested in everything going on. Once the assistant "trainers" gelding walked away Cupid began to get extremely strong, my trainer walked over and began walking her around and disciplining her. Cupid ended up back in her stall, fully tacked up, and had another explosive temper tantrum. For about 30 minutes she fought with my trainer and basically panicked. There was nothing I could do except watch and pray that she calmed down quickly and didn't get hurt. Once she calmed down enough we got her tack off and gave her some Gatorade since she had sweat during her fit. I honestly didn't know if I would be able to show her, or if we needed to scratch from our classes and call it a day. Once she settled and became interested in her hay I relaxed a bit. Our jumper rider was competing in the morning hunter classes and I went to watch her ride. She was riding the stallion again and, despite him being more of a jumper, they did extremely well. I believe they placed in one of their fence classes! Once she finished we all settled in for the long wait for the rest of the classes. One of the riders was in pre-short, and the rest were in pre-long. Cupid entertained herself by chewing a power cord that had dropped in her reach, flipping her halter off its hook, and mooching all the food she could off me. She quickly decided that she isn't a fan of Cheetos but loves potato chips. The girl in the pre-short class had been supposed to show the mare but was switched to the assistant "trainers" gelding, who she had previously shown. It was decided that the mare would not be shown and both riders assigned to her would be switched to other horses. When the time came I tacked up Cupid and got her ready for our class. We would be competing against the assistant "trainer" and her gelding, and the teen on the "skittish" gelding. Our jumper rider would also be riding the four year old gelding in the flat classes to give him show experience, but because she had shown in the main ring she would be riding as an exhibition rider. We had all agreed that we would be skipping our jackets and using our long sleeve sun shirts since it was so hot. I entered the first flat class, pre-long hunter under saddle, feeling apprehensive about it. 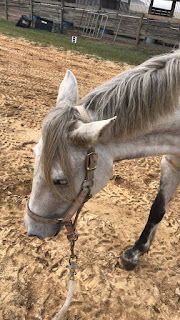 Cupid and I were showing against two seasoned show horses, the "skittish" gelding and the assistant "trainers" gelding, and I didn't want to walk away without placing. I had worked too hard with her to get our flat near perfect and wanted to show off a bit since the day before had been so good. Like before this judge only asked for the walk and the trot both ways. We lined up in the center of the ring and awaited the placings. Cupid and I took 5th, the assistant "trainer" took 2nd, and the teen took 1st. Like before we went straight into our equitation flat class which took even quicker than the hunter flat class. We walked and trotted both ways then were called to the center of the ring. I was happy to hear my name called for 4th, and the assistant "trainer" took 1st, the teen did not place. Despite having asked my trainer to put me in the first rotation she waited until the last rotation. This honestly pissed me off because I get nervous when I have to wait for my events. Once I've gotten ready I want to get into the ring, put down the best ride I possibly can, and leave. Being in the last rotation means I have the time to overthink about everything that can go wrong. While we waited I walked Cupid over to a trainer I had previously met on an earlier barn search. We spoke for a bit and she gave me several tips and compliments about my flat work. When the time came for our fence rounds the assistant "trainer" had me go before her. Cupid and I entered the ring and had a beautiful first round. The course was line by the judge, diagonal, line by the spectators, diagonal. We exited the ring and waited for our second round. After the assistant "trainer" and a few other riders did their first rounds we entered for our second round. This time it would be line by spectators, diagonal, line by judge, diagonal. Cupid and I approached the first fence at a good trot, got right up to our takeoff spot, and stopped. I circled and tried the approach again, this time adding a bit more leg, we reached the fence and shied to the side. Feeling like I wanted to cry I circled again, approached the fence while adding leg and holding my inside rein, then stopped. It was at that point the announcer excused us from the ring. We left and I felt like crying, I had failed Cupid and failed myself. My trainer brushed us off and I took Cupid to the warm up ring to get her over the fence there. I did not want her to learn that she could refuse fences in the show ring and end our ride on her terms. She popped over both verticals in the warm up ring after refusing the first once and we walked out. As we walked out I saw the trainer we had previously met, we wandered over to her to talk for a bit and she immediately began to talk to me about my rounds. She pointed out that I had brought my heels up during the second round, pushed myself a bit onto Cupid's neck in my two-point, and looked down at the fence. It was nice to receive that feedback and the corrections about what I could do better. I took Cupid back to the barn, packed my things, and gave her the rest of the carrots. We might have been humiliated in the ring but she only did what I asked her. If my cues had been clearer we would have had no problem finishing the rest of our division. We walked away with a 5th in the fence class we completed. I'm honestly extremely proud of this 5th because it shows that despite our refusals we are a good pairing and we will be able to succeed in this division (and higher ones) once I correct my faults. Overall the weekend was a learning experience. I honestly think if I worked Cupid in the mornings she wouldn't have the temper tantrums. I also need to work on my jumping form and gain Cupid's confidence in me.